Earthquakes are the shaking, rolling or a sudden shock of the earth’s surface. Earthquakes happen along cracks (called fault lines) in the earth’s surface. Earthquakes can be felt over large areas, although they usually last less than one minute. Earthquakes cannot be predicted – although scientists are working on it. Earthquakes can happen at anytime and the Caribbean is known to experience them. 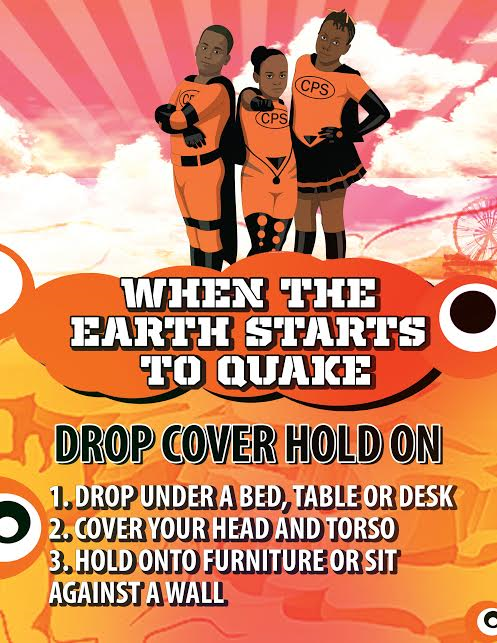 Ask your family to hold earthquake drills – drop, cover and hold on! Stay away from windows, glass, lighting fixtures or furniture that could fall – like bookcases. Stay there. Move away from buildings, streetlights and wires. They may fall and hurt you. Stay out in the open until the shaking stops. Buildings may collapse and hurt you. Cover your mouth and nose with your shirt. Tap on a pipe or wall so that rescuers can find you. Expect aftershocks, They are usually not as strong but can cause damage. Open cabinets carefully. Objects may have moved and could fall on you. Seismic Activity – another word for earthquakes, along with tremors, quakes and shakers. Fault Lines – cracks in the rocks below the earth’s surface. Aftershock – a smaller earthquake that follows the main shock or previous earthquake. Epicenter – the center of an earthquake, from which seismic waves are sent spherically in many directions. Seismograph – a machine that measures an earthquake.